Happy Tuesday. We have freezing rain and the buses aren't cancelled, yet there have been days when rumoured snowstorms have brought on cancellations. I don't get it. In other news, I've been wide awake since 4:55am, mind racing, so I'm a bit punchy. Would you like a free download of the National Film Board documentary, Pink Ribbons Inc.? All you have to do is complete a short (3 min.) questionnaire. After you download and watch the film, you're asked to fill out another short (5 min.) questionnaire. Support the NFB by telling them what you think and watch a great movie for free! Healthline, a health related website is running a contest for best Health Blog. First prize is $1000 and Breast Cancer? But Doctor...I Hate Pink! is currently in the top spot. The author has metastatic breast cancer in it's later stages and plans to use the money towards a college fund for her son. She also writes a great, raw, honest, smart and hopeful blog - despite acknowledging the fact that she's dying. Will you take a moment and vote for her? You can vote once a day until February 15th. A new episode of the Frivolity podcast is up, in which I talk about making stuff and silencing my inner critic. It's is available in audio only and less than 10 minutes long. How do you deal with you inner critic? It's been a couple of months since I recorded this but I haven't shared. 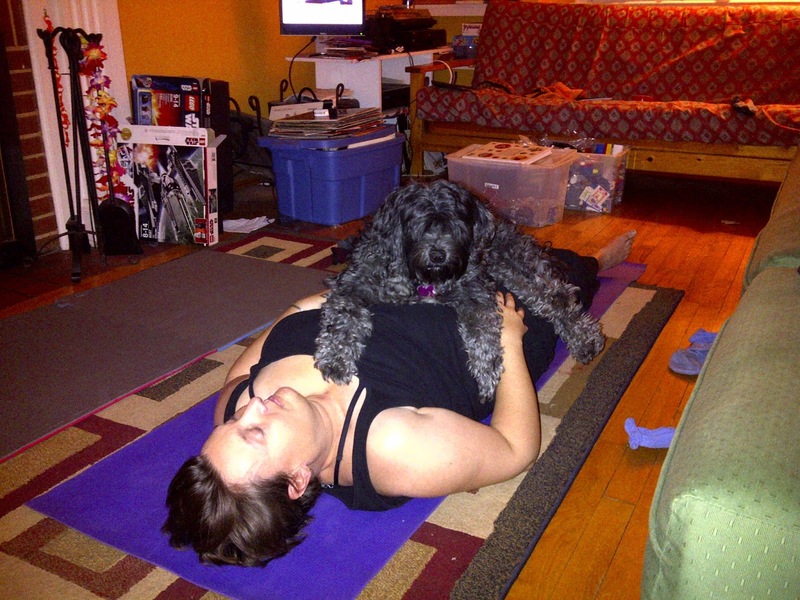 Listen (and watch, if you like) as Andrea and I discuss ways to become more frivolous. I think it's a really good time for me to remember that a little Frivolity is very good for the soul. I just got a call from my medical oncologist. My scans are all clear. I'd no reason to doubt that but I feel enormously relieved all the same. Dr. G says I'm now being treated like "a patient with two compartments." I'll continue to take a drug that has protected every part of me, except my brain, very well. And, until there are new developments, the only thing we can do the area inside my skull is to keep monitoring and decide how to treat tumours if and when they occur. My next MRI is in two months. Bring on the tube with the banging! My youngest son is home from school today. He's not sick. He just didn't sleep very well last night. He's been out of sorts lately - hard on himself and everyone around him. It just felt like a day off would be a really good idea. We've a windchill of -35C at the moment (that's an almost as cold sounding -31F). It's warmer than yesterday but still not really warm enough to play outside. This morning, I pretty much left him to his own devices. 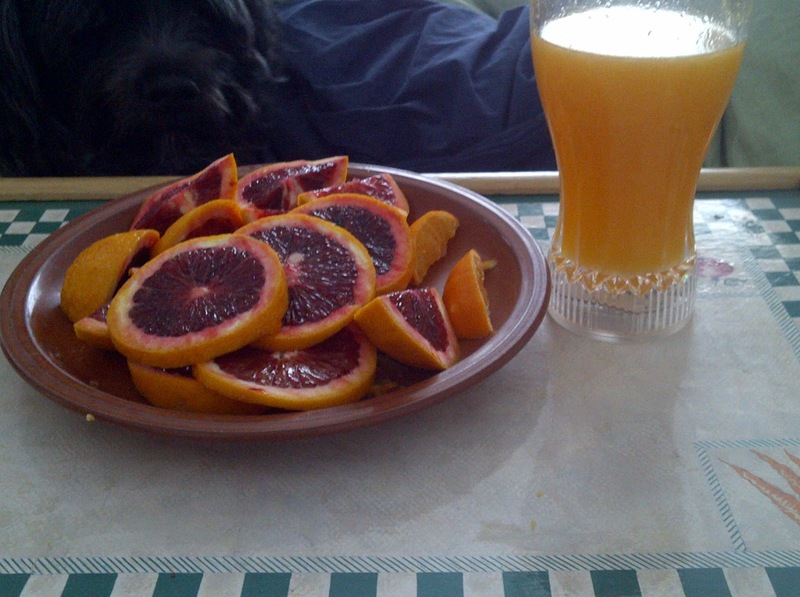 As per my stipulation of "not a lot of screen" (I'm convinced that watching videos and playing video games compound his bad mood, which would defeat the purpose of a day off), he asked me if he could make "pure juice" in the kitchen. I was hesitant but Tim said I could trust the 9 year old with a hand juicer and a paring knife (this is when I'm glad that the kids have two parents. The 14 year old would still not be leaving the house by himself). A short while later, Daniel brought me a tray in bed. He came back a few seconds later with a snack. As we sat together and drank and ate, Daniel observed that food tastes better when you make it yourself. It tastes just as good when your child makes it for you. I have just a little more writing to get done, then we're going to make soup (he bought a big bag of sweet potatoes for me with his own money, on a recent trip to the Farmers' Market in Guelph) and then do a yoga DVD. If there's time after that we may do a little spelling homework. I'm having a mental health day, too. I haven't even mentioned yet that I had some CT scans last Friday morning. I guess the whole experience was overshadowed by the CyberKnife drama and it's after effects. The scans themselves (done all at once but there were three) were a breeze. The technician got my vein (for injecting the contrast dye) on the first poke and all went smoothly. I'm an hold hand at these things and being nervous about the unknown of CyberKnife left me no room to worry about the scans. I was out of there in half an hour and promptly forgot about it, in favour of what loomed ahead. Now though, five days later, I'm worrying. I had my thorax, abdomen and pelvis scanned. I have absolutely no reason - except history - to be worried. But it's nagging at me. I don't see my medical oncologist until February 6th but I can't wait until then for answers. I see my GP tomorrow (for a referral) and she always gets copies. Perhaps she'll be able to tell me something. If not, I'm calling the nurse who works with my oncologist on Thursday. She's given me answers before. It's supposed to take a week for results. Thursday is almost a week later. It would be nice to be let off the hook of suspense. I'd become quite blase about CT scans for a while. I didn't even care if I had them. The discovery of the brain tumour has certainly shaken my confidence. I really want to write a longer post about CyberKnife. In the end, I only had one session (and it felt like more than enough) but it might as well have been three because this "no side-effect" treatment made me really sick. Four days later and I still feel sick to my stomach. I was just remembering thinking that after chemotherapy, my breast cancer radiation would be "a walk in the park" but I hated almost every minute of it. And I had almost every possible side effect. I hate radiation. It's really worth it, though if it keeps my tumour from coming back. And if others appear, I know this treatment is there for me. 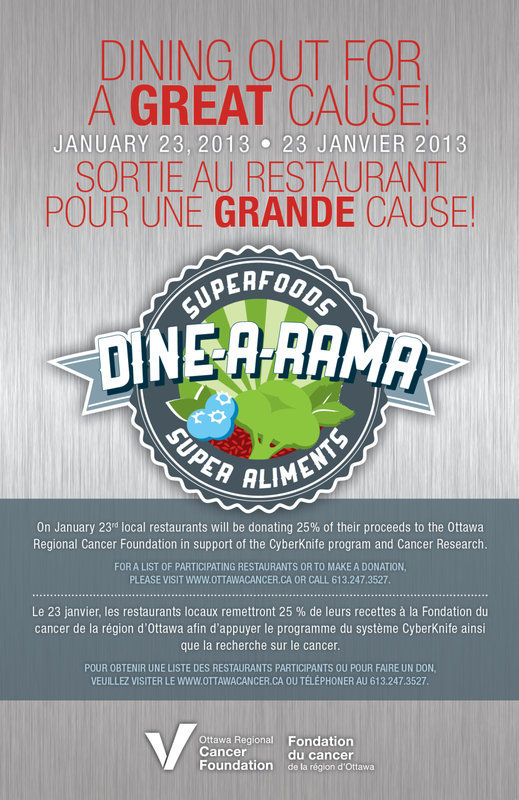 The small print, that's nearly impossible to read, explains that on January 23rd, participating local restaurants will be donating 25% of their proceeds to the CyberKnife and research programs at the Ottawa Cancer Centre. It's a good idea any day of the week but since I just finished CyberKnife treatment, it seems particularly appropriate (assuming my stomach agrees and I feel better). I'll be going to the Atomic Rooster with Tim because I've heard really good things, Tim says the food looked great when he was there last week for a friend's vernissage and because her art show is still running and I can see it too. 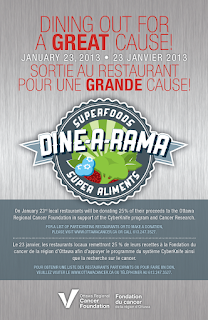 Click here for the list of participating restaurants (scroll down) There are more than 100! and to read more about CyberKnife in Ottawa. Finally, here's a short video where a neurosurgeon (mine!) talks about the importance of the CyberKnife to the Ottawa Hospital. The pity party is over. I'm feeling much better now. My energy levels have started to come back and my walks are getting longer and faster. I had a wonderful week in Florida that contributed greatly to healing. I even swam a bit while I was there. I can do the sidestroke and the crawl but my neck won't yet let me do the breast stroke. I did a bunch of balance tests today that I passed with flying colours. My balance wasn't really that bad but the tests I found challenging (pretty much the same as a sobriety test) two months ago were really easy to do today. I hope that translates into less falling down. I still have pain in the back of my head. It's not near the incision, which is long and itchy but healing well. This feels more like a giant bruise on the top and back of my head. I can't bear for anyone to touch me there, sometimes it throbs and when I overdo it, my head feels like it's in a vise. It turns out that this is not unusual and healing will take three to six months. Just knowing that it's no big deal (and not a sign that my brain is swelling) is very reassuring. Apparently surgery damaged my muscles and all the extra blood and air beneath the surface need to go away. Or something like that. I was given a more scientific explanation but that's what I retained. Tomorrow, Monday and Tuesday, I will undergo three CyberKnife sessions (either 'one dose in three treatments' or 'one treatment in three doses.' I can't remember. I had a terrible appointment with my radiation oncologist to lay out the plan but I'll save that for later. I really don't feel like making my blood boil so close to bed time). I still don't much like my radiation oncologist but I hear he's really good at the zapping part, which is what's important. I also have a CT scan tomorrow of my abdomen and thorax. I'll have an MRI in two months and then every three to six months thereafter. I have a serious crush on my surgeon. I think Tim might too. After Dr. S. left our appointment today, we both gushed, "He's so good!" I feel like I'm crazy busy, which is why I haven't been writing. I guess when you do nothing for weeks at a time, you end up paying the price. I need to be careful not to overdo it, though (see above, re the vise). And how have you all been for the last eight weeks?